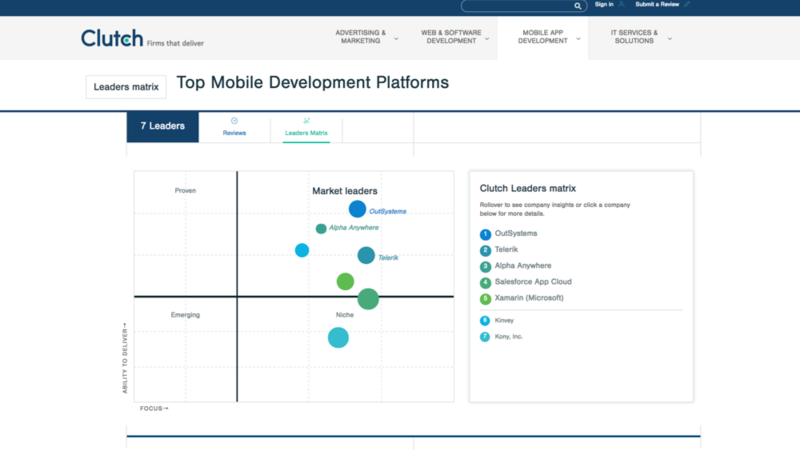 Alpha Anywhere named a top vendor in the 2017 Clutch Leaders Matrix for Mobile App Development Platforms. Alpha Anywhere outperformed vendors such as Appcelerator, Red Hat, Pega 7, Kinvey and Kony. Clutch Analysts gave Alpha Anywhere high marks for Ability to Deliver (judged as Customer Reviews, Support and Market Presence) and Features (judged as App Development and Management). Most impressive, Alpha Anywhere received perfect scores in customer reviews -- the highest score of any vendor (a 9.2) and placing Alpha Anywhere at the top of the chart for customer satisfaction. Read additional coverage of Alpha Anywhere from the analyst team at Clutch. Read why customers consistently give Alpha Anywhere software perfect scores in industry reviews. Contact us to see if Alpha Anywhere is a fit for your organization.